We have lots of perennial ferns for our area. We carry Button, Lady, Autumn, Bird's Nest, Maidenhair, Rabbit's Foot, Staghorn, Boston and more! Call for varieties. 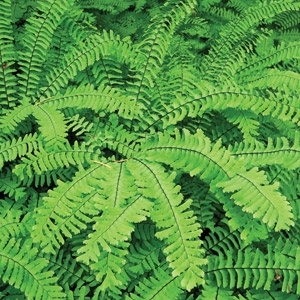 Ferns are among the most beautiful houseplants. With lacy fronds and a classic texture, they work well in just about any interior design scheme, from country casual to formal. There's a wider variety of ferns available than most folks realize, so there's abundant opportunity to decorate with these houseplants.